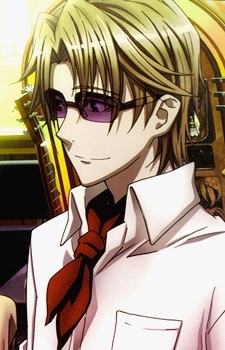 Izumo is a very composed individual, reacting calmly even in dangerous or extreme situations. He retains this trait even when in the midst of a battle. However, because of his nature, others often tend to be intimidated by him. Additionally, he is quite intelligent and knowledgeable of the people or things around him. Izumo has a fairly extensive knowledge of people's backgrounds. Izumo is an avid smoker, and speaks in the Kyoto dialect. Owner of the bar "HOMRA", and has known Suoh for a long time. He has a linked past connection with Seri Awashima, of Scepter 4 both seem seecretly friendly when no other clansmen from both HOMRA and Scepter 4 are around. Even though he is a member of HOMRA. Though they didn't go to the same high school, still secretly friends when dealing with clan disputes between Scepter 4 and HOMRA in his bar. Believing that both know each other before joining separate clans.